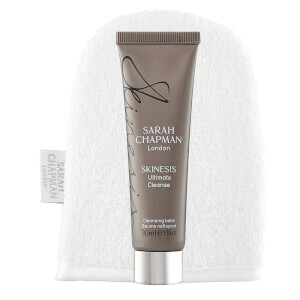 Target blemishes with the Skinesis Spot SOS Sticker from Sarah Chapman; an innovative, virtually invisible patch that works to decongest and soothe the affected area for a rapid recovery. Suitable for all skin types, ages and genders, the completely transparent sticker is easily applied, creating a hygienic, protective shield that helps prevent you from touching and picking at spots. Each patch is infused with a concentrated dosage of skin-perfecting actives; Salicylic Acid effectively decongests and exfoliates, unclogging the affected pores, while P-Refinyl® reduces excess sebum production. Vitamin C combats free radical damage and helps discourage dark marks, plus a soothing blend of Grape Seed and Soy Oils seek to balance moisture levels. Sytenol® efficiently calms irritation, inflammation and redness. Ideal for breakout prone, oily skin, the ingenious spot stickers are an effective, easy and quick method of minimising and preventing blemishes for a clear and confident complexion. Presented with a chic, portable carry case to stash in your bag for on-the-go spot treatment. Suitable for use beneath makeup. Reapply as often as required. Suggested usage: replace every 4 hours. For full directions see included guide. Acrylates Copolymer, Glycine Soja Oil, Vitis Vinifera Seed Oil, Bakuchiol, Lens Esculenta Seed Extract, Salicylic Acid, Ascorbyl Palmitate.